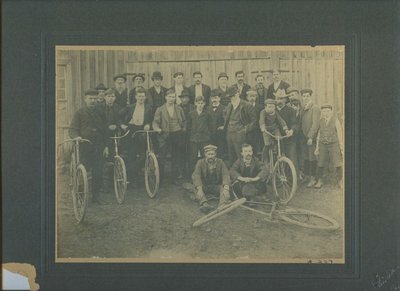 A photograph of employees of the Newton Tanning Company. Back row, left to right: unknown, N. Garness, Geo Sims, Sr., S. Kirkland, Bertram Newton, unknown, [?] Garbutt, unknown, George Hopper, and Tom Newton. Front row: Dave Mckenzie, unknown, J. Brydon, A. Hamilton, unknown, F. Dolen, unknown, Andrew Newton, C. Skeele, W. Naughton, unknown, unknown, unknown, J. Naughton, and N. Naughton. Sitting: L. McLeod, F. Grainger. Garness, N. ; Sims, George, Sr. ; Kirkland, S. ; Newton, Bertram ; Garbutt ; Hopper, George ; Newton, Tom ; Mckenzie, Dave ; Brydon, J. ; Hamilton, A. ; Dolen, F. ; Newton, Andrew ; Skeele, C. ; Naughton, W. ; Naughton, J. ; Naughton, N. ; McLeod, L. ; Grainger, F.